Google, Paypal, Facebook and Microsoft and other some technology and web major are taking some crucial steps to make Internet more secure and safe. As Google arranges and maintain (Google hall of fame) and Facebook also maintains a program Facebook Whitehat in which these two Internet rivals used to offer huge bug bounty almost ranging from $300 to $5000 for detecting some of the important vulnerabilities. Moreover, Nokia is also offering a brand new Nokia Lumia 920 for detecting an important bug and vulnerability that can cause harmful results. 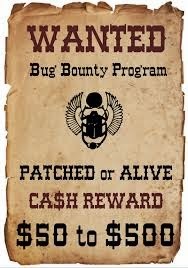 Facebook, Google and Microsoft and even Paypal is found to be very serious in that matter and found offering exciting rewards that is gaining interest among Internet bug tester and some anonymous hackers and almost 50 % of the beginner hackers are spending their half time analysing vulnerabilities among web and applications.